YOU’VE SEEN THE SYMBOL EVERYWHERE: at the office, at school, at the store, at home, and on many of the products you use every day. There’s even one on this very page: three chasing arrows that form a triangle— the internationally recognized symbol for recycling. The why is quite simple: Recycling is one of the ways that you, as a consumer, can help preserve the environment for yourself, your family and future generations. When you recycle, you help reduce the amount of natural resources that are consumed for every new product. You also help reduce the air and water pollution associated with their manufacturing. 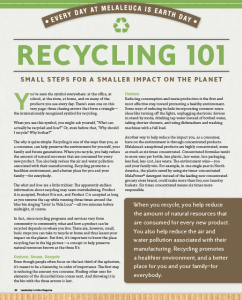 Recycling promotes a healthier environment, and a better place for you and your family—for everybody. The what and how are a little trickier. The apparently endless information about recycling may seem overwhelming. Product A is accepted, Product B is not, and Product C is accepted as long as you remove the cap while running three times around the blue bin singing “Livin’ la Vida Loca”—all two minutes before midnight, of course. Even though people often focus on the last third of the aphorism, it’s meant to be a hierarchy, in order of importance. The first step is reducing the amount you consume. Finding other uses for elements of the discarded item comes next. And throwing it in the bin with the three arrows is last. Reducing consumption and waste production is the first and most effective step toward promoting a healthy environment. Some ways of reducing include incorporating common-sense ideas like turning off the lights, unplugging electronic devices in stand-by mode, drinking tap water instead of bottled water, taking shorter showers, and using dishwashers and washing machines with a full load. Another way to help reduce the impact you, as a consumer, have on the environment is through concentrated products. Melaleuca’s exceptional products are highly concentrated, some as much as six times concentrated. Concentrated formulas result in more uses per bottle, less plastic, less water, less packaging, less fuel, less cost, less waste. The environment wins—you and your family win. For example, in one single year in North America, the plastic saved by using six-times-concentrated MelaPower® detergent instead of the leading non-concentrated grocery store brand, could make more than 600,000 laundry baskets. Six times concentrated means six times more responsible. Another way Melaleuca products help you reduce your impact on the environment is through its ingredients. Melaleuca has taken a firm stand against chemicals that pollute both the environment and your home. Instead of chlorine bleach, for example, Melaleuca products use the power of citric acid. And instead of ammonium compounds in its disinfectant, they use the herb thyme. Diamond Brite® is a great example of why Melaleuca products are not just safer for the environment and your home, but better for them. A number of states have banned phosphates in dishwasher detergents. And now, fearful of the ban going nationwide, the major dishwasher detergent manufacturers are scrambling to find a phosphate-free formula. But the detergents they’re rushing to the shelves are bringing in loads of complaints about cloudy, spotty dishes. Diamond Brite has been free of phosphates since 1994. Melaleuca has had years to perfect Diamond Brite’s cleaning power, and it shows. No chlorine bleach. No phosphates. Now that’s a better solution for your environment inside and out that works! Remember, reducing the amount of waste, energy consumption and harsh chemicals you put in the environment is the first and most important step to protecting it. Reuse means extending the “life” or repurposing an item rather than discarding it. Reusing includes garage sales, hand-me-downs, travel mugs, repairing damaged items and finding other uses for those that no longer serve their original purpose (making scratch paper out of print paper, or using grocery store plastic bags for little trash cans, for instance). Another good example of reusing is found in EcoSense® products. EcoSense allows you to reuse the same spray bottle again and again, thus reducing the amount of raw materials, energy and waste that purchasing a new bottle every time would entail. For example, by purchasing one bottle of Tub & TileTM, you can keep six empty spray bottles of Lime-A-Way® out of the landfill. Recycling is an important step after you’ve already reduced and reused. It is the process of gathering, remanufacturing, and reusing materials instead of disposing of them. This helps conserve natural materials and energy that companies would otherwise use in the manufacturing of new products. Recycling also reduces the amount of waste going into landfills, and lessens the pollution that may result from waste disposal. Most communities have designated recycling centers. Many cities also offer an inexpensive curbside pickup service, which is the easiest and most convenient way to recycle. Visit your town or city website for information on what is collected. Two good resources for recycling programs in the United States are found at Earth911.com and www.epa.gov (the U.S. Environmental Protection Agency website). Look for the program in your area that is most convenient for you. The essence of recycling is the cyclical movement of materials through the system, eliminating the need for extracting more raw materials. Supporting recycling means closing this loop by not only recycling, but also purchasing recycled products. There’s recycled content in virtually everything you buy. For instance, the very page you’re reading right now is printed on recycled paper. And all Melaleuca packaging materials are compatible with recycling, including corrugated paperboard, paperboard and plastics. Make sure you purchase recycled products whenever possible. Without this vital third step, the recycling cycle is incomplete. These steps will get you started in promoting a healthier environment and thus make a difference for you and the world around you. At the end of the day, it’s all about enhancing the lives of those we touch… including Mother Earth.